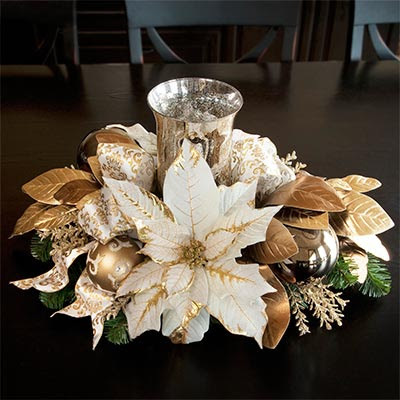 Blue Artichoke Interiors: Christmas Decorating- Start Planning Now! I love getting my home decor catalogs in the mail. This time of year, they are just magical to look at. I tend to resent the commercialization of the season and how the big corporations try to stretch the Christmas season longer and longer each year. Yet, the beauty of the season is still breath taking. It has been a long time since I have decorated my home for Christmas. I converted to Judaism 22 years ago, but I still love holiday decor and all the beautiful displays in these catalogs. I adore this Coastal Christmas vignette from Wisteria. 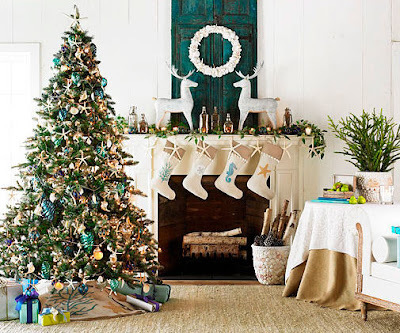 The nautical theme on the stockings and tree skirt are so wonderful as is the seaside garland. I love burlap. I know that it is so over done. I know you see it everywhere. However, I still love the natural, textural qualities of this material in home decor. Burlap is perfect for a fringed Christmas tree skirt as shown in this Ballard Designs photo. When it comes to trimming the tree, Ballard Designs also has Silver Button Garland that is fabulous. It comes in a capiz button version too. 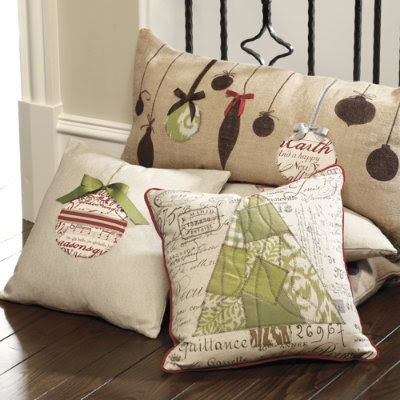 I'm also lovin' the Holiday Patchwork Pillows from Ballard Designs. They are perfect for spreading the festivities to your chairs, sofas, and bedrooms. Many have mantels that look bare if not dressed for the holidays. At Grandin Road I found this wonderful Martha Stewart Beaded LED Garland. By the way, Costco has battery operated real wax LED candles in a four pack for $19.99 now. I picked up a couple packs myself and need to go back for a few more. These are wonderful for holiday decorating and so much safer than real candles in so many social situations, especially around young children and pets. Also fun for your mantle are these snowflake candle holders from Crate and Barrel. Choose either the larger hurricane or the smaller candle holder singular or in pairs. 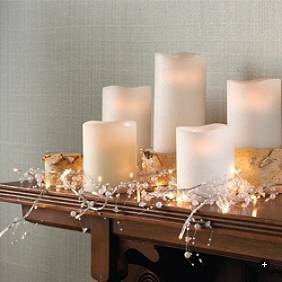 Also great for the holidays and long after the new year rolls around are these Mercury Glass Pillar Holders from Pottery Barn. These create the look of instant antiques and would mix well with a variety of real antique candle holders if you are lucky enough to find them at antique stores and flea markets. Mix them with some garland (real or faux) and it will be wonderful. While we are talking about mantles, I just love, love, love clear hurricanes for their versatility. It seems as if every home decor store carries some variation of them. 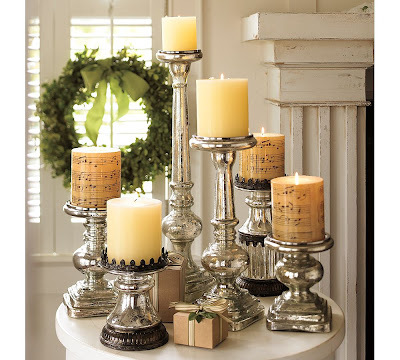 They work beautifully with or without candles in every season. If you find some fabulous glass Christmas ornaments on sale, stock up. 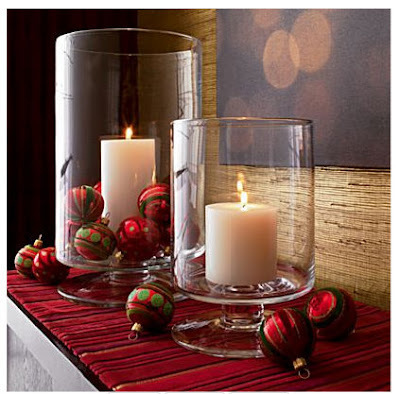 They look so festive in hurricanes on your mantle or even as a centerpiece for your holiday meal. I love this picture of holiday hurricanes. If you like a traditional centerpiece and are on a budget like everyone else this year, think Costco. 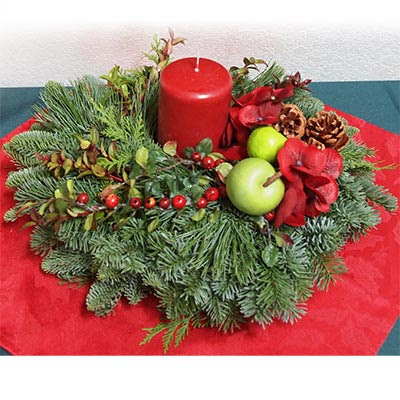 Here are two Costco holiday centerpiece options, one fresh greenery and the other artificial, that can be delivered directly to your home in time for the holidays. I love crafts, but don't have as much time for them as I would like these days. 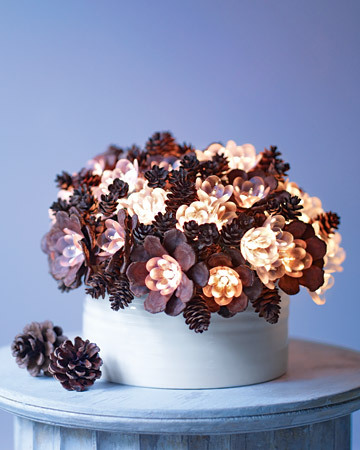 For those who have the time, check out this lovely Lighted Pinecone Arrangement craft found on Martha Stewart Living. I think it would be great to make for Thanksgiving and would work all through Christmas. 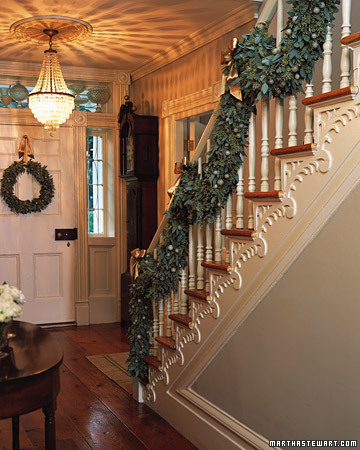 Most of us don't have the grand staircase of Martha Stewart's Turkey Hill Estate, but I wanted to share how festive her stairs look draped in eucalyptus garland. Many homes would look lovely with this kind of staircase treatment. See how she did it. 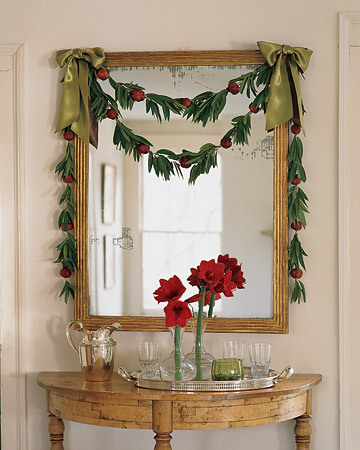 For those of us with more modest entries, a little garland around the mirror might just do the trick. Martha shows us how to do elegant on a smaller scale. This Bay Leaf and Pomegranate Garland makes a beautiful entry. 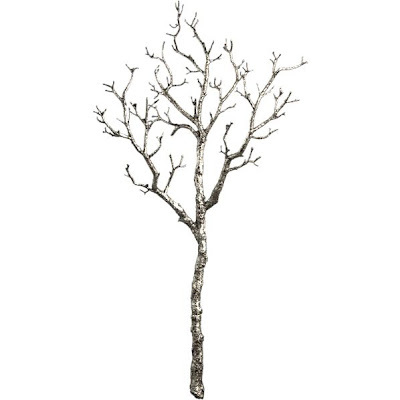 On the Crate and Barrel website I found an interesting decoration I would like to share. I haven't been able to find it used in a picture, but it has some interesting decorating possibilities. This 36" Antiqued Silver Branch I think could look beautiful with some crystal icicle ornaments. Pretty single color ornaments would also be attractive. 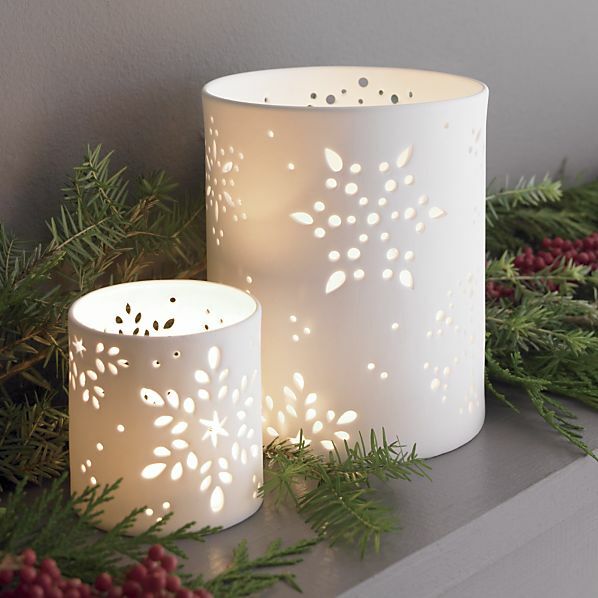 How would you use this or have you found any pictures from Crate and Barrel that I may not be aware of showing how they have used this in holiday decor? Holiday dinnerware can add so much to the table. I found some pretty glam dinnerware for the holidays and beyond at Z Gallerie. Check out the Madera Dinnerware with a faux bois pattern. 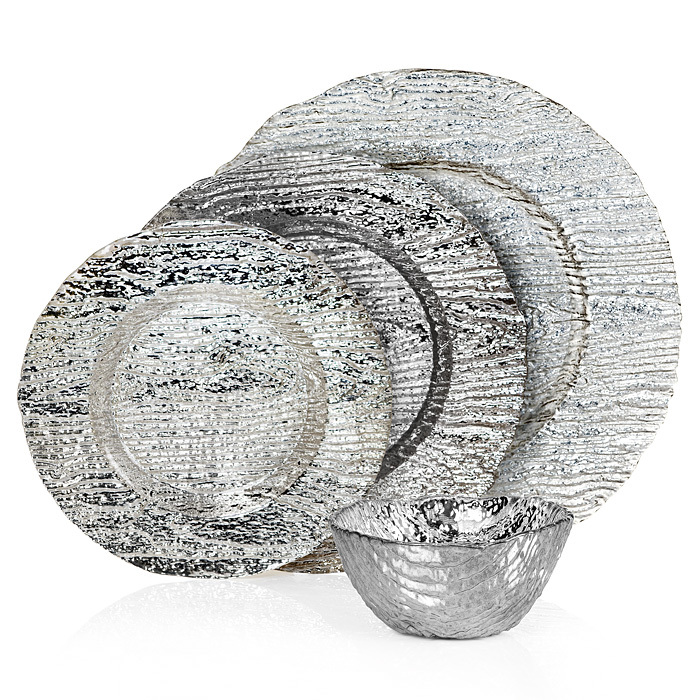 You can buy a complete set or upgrade your existing dinnerware by purchasing Madera chargers. Perfection! Now if only they didn't need to be hand washed. Hanukkah is a much harder holiday to decorate for, but I'll see what I can find for my Jewish friends. I hope you have enjoyed some of my Christmas decorating favorites this season. Please share some of yours! Thanks for the inspiration! I love looking at all my magazines this time of year as well! We have children in the house so we tend to use our tried and true decorations on our tree, but with a beach y twist! This year we'll be adding sea shells and starfish and holly to our greenery for a beach y traditional look! Christmas just isn't Christmas in our house without honoring the deep greens and brilliant reds of the season!